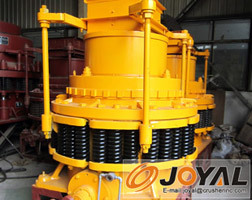 The Spring Cone Crusher is widely used for secondary and fine crushing in the fields of mining, chemical industry, building materials, metallurgies and so on. The Cone Crusher can crush materials with Moh’s scale in middle and high hardness such as ironstone, copper ore, limestone, quartz, granite, rock and so on. The standard type (PYB) is applied to secondary crushing; the medium type (PYZ) and the short-head (PYD) are applied to fine crushing.